When the topic of one’s personal faith journey comes up, mine was irrevocably entwined with two of the well known and powerful Mennonite orators of the day, George R. Brunk II and Myron S. Augsburger. I once got into trouble with the former (now deceased) and am still on friendly speaking terms with the latter. Both held a commanding presence in the Mennonite church of eastern U.S. of the 50s and 60s when I was growing up. I’ll share my intersections with both of these men in a three-part blog. … and I was never even a seminary student, and that was part of the problem. All through my years at Eastern Mennonite College except for the year I lived abroad, I was an active part of the Weather Vane (student newspaper) staff, which served as my practicum in journalism. Everyone needs a place to connect on a college campus and while our college was not big, the writers/photographers/designers who made up the staffs of our newspaper, literary magazine and yearbook was where I hung out. 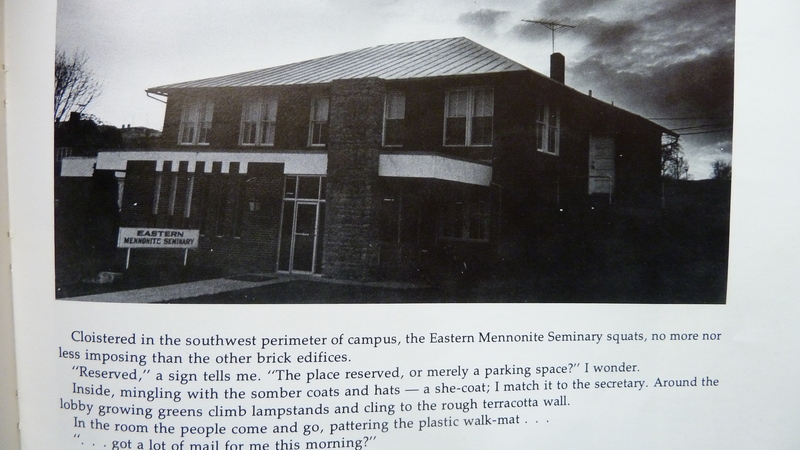 So I was asked to write a descriptive essay on Eastern Mennonite Seminary for the college yearbook in 1975. 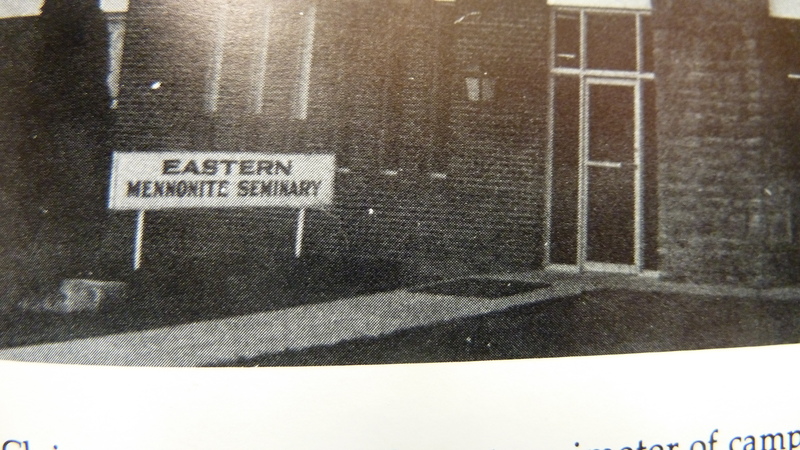 The seminary was part of the EMC campus and community, yet its own entity on the edge of campus, even then. The yearbook that year attempted to be an artsy-fartsy attempt to be literary and cool, not just the same old yearbook with pictures and descriptive captions but more of an impressionistic feel for life on campus. That was what the editors described it, at least the way I remember it, and that’s what I wrote about the seminary in a half page essay to accompany a dark, foreboding-looking photo of the seminary building. In those days not very many women went to seminary. There were only two that year, which probably represented a real growth spurt. I was starkly aware of my gender as I walked through the seminary building as I attempted to get inspired for my essay. 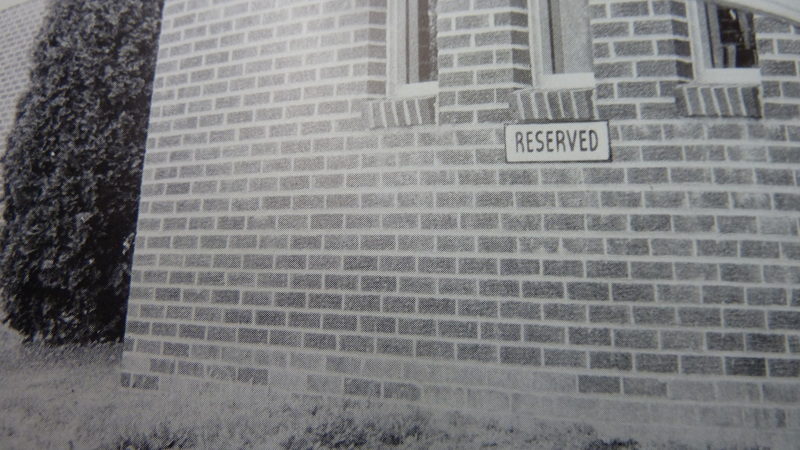 Cloistered on the southwest perimeter of campus, the Eastern Mennonite Seminary squats, nor more or less imposing than the other brick edifices. “Reserved,” a sign tells me. “The place reserved, or merely a parking space?” I wonder. Inside, mingling with the somber coats and hats—a she-coat; I match it to the secretary. 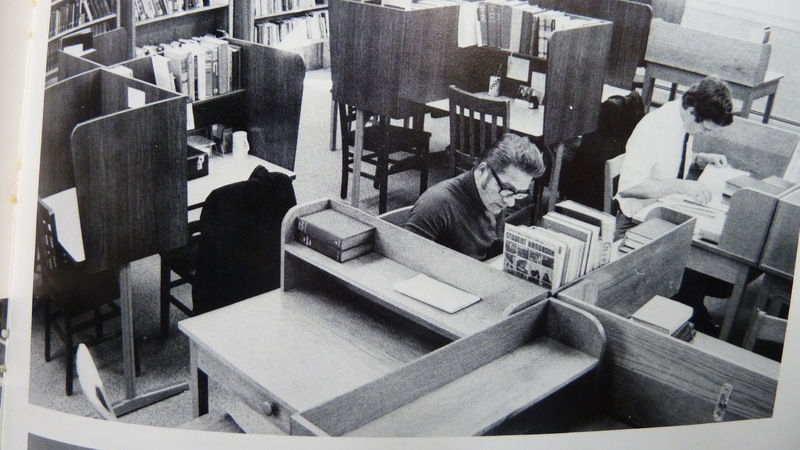 Burrowing into Greek, Hebrew, Pastoral Care, Systematic Theology and Early Christian Thought, scholars lose themselves in individual study carrels. Here a photo of a baby, there a stale Styrofoam coffee cup. They man their carrels and barely stir as my female legs prowl into their den. I ended the essay reflecting on the pleasant and inviting chapel atmosphere where there were cushions and hymnbooks in a holy hush. All in all, to me it was a fair description–for a surface look that any stranger walking in might have seen or observed. But it was NOT taken that way by seminary staff and especially not the Dean. My face grew hot with shame and embarrassment as I read a long angry letter on the Opinion Board (I do not recall who wrote it) in the campus center not long after the Shen was published. How could any underclassman think they were representing what actually goes on in the studies of a 2-3 year graduate program without interviewing or getting information from the administrators or faculty there? How could this short description possibly do justice to the seminary program? In hindsight and with many years of “maturing,” I certainly can understand the objections. I don’t remember now whether the yearbook editors offered a rebuttal on the opinion board or decided to just “let it go.” I do know that the upshot was that the following year, the seminary published its own yearbook, not just a page or small section in the underclassman year book over which it had no control. That was then. Fast forward a few years, after I had been working in a sister Mennonite institution, then called Mennonite Broadcasts Inc., a few years. My offense to the seminary dean occasionally pricked my conscience, or at least my desire to do as the scripture tells us in Romans 12:18, “As far as it lies within you to leave peaceably with all.” This was the manifesto my father taught me from little up. 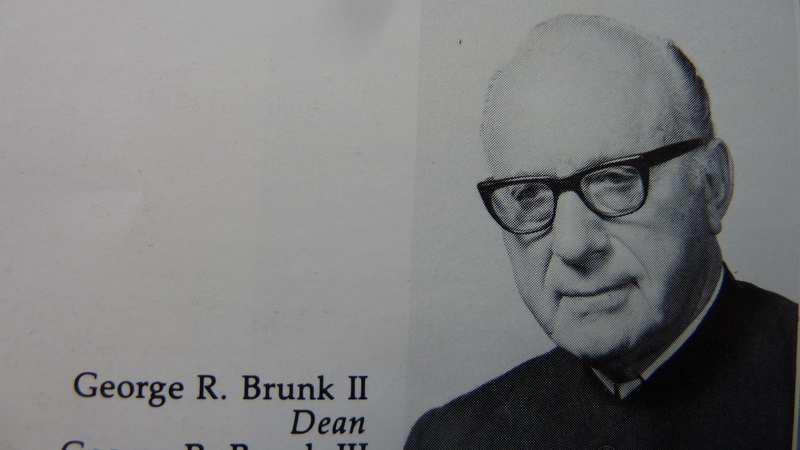 I did not like the feeling of having an unsettled issue with George R. Brunk II. I wanted to find harmony. He was, after all, the evangelist who had once inspired me to walk the long saw dust trail, literally, in the days when many of my peers were also doing the same thing. 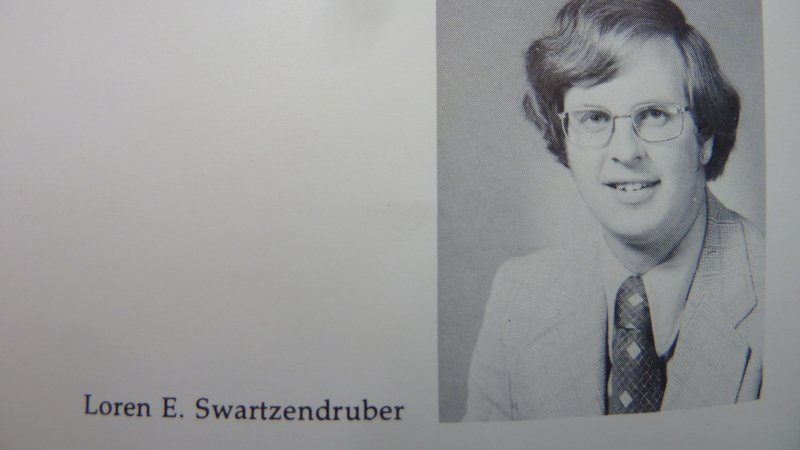 In the end, I don’t think I did much damage to the overall fine reputation of the seminary: pictured above is the current Eastern Mennonite University president Loren E. Swartzentruber, who was in seminary during those days. 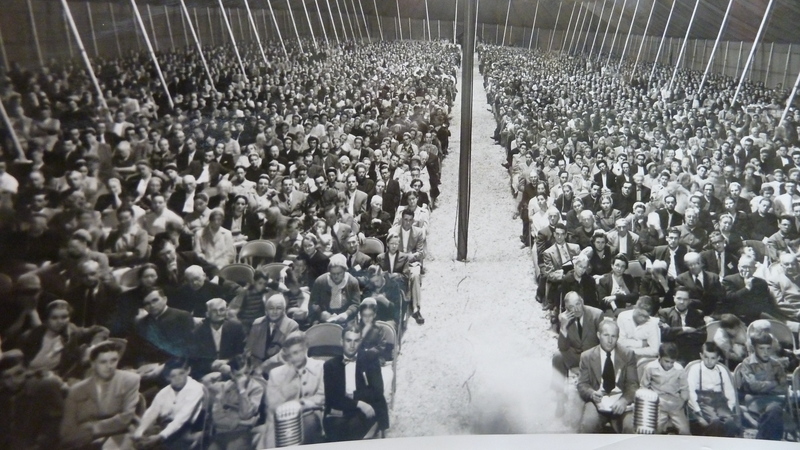 The sawdust trail at a Brunk revival in Indiana, conducted by the “Brunk Brothers” 1952. In my next post I’ll tell you which of my relatives is found in this wonderful photo and why I felt a special need to “make things right” with George R. Brunk II. Shen Photo credits: I cannot see that our yearbook–(are any yearbooks?) copyrighted nor were the photos in the 1975 volume credited to specific photographers but are listed as follows (many of whom were fine friends of mine at the time): Dave Kraybill, J. Marcos Hostettler, Marian Eberly, Jim Mast, Jim Bishop, Jon Byler, Ken Pellman, Keith Gingerich, Deb Stoltzfus, Tim Landis. 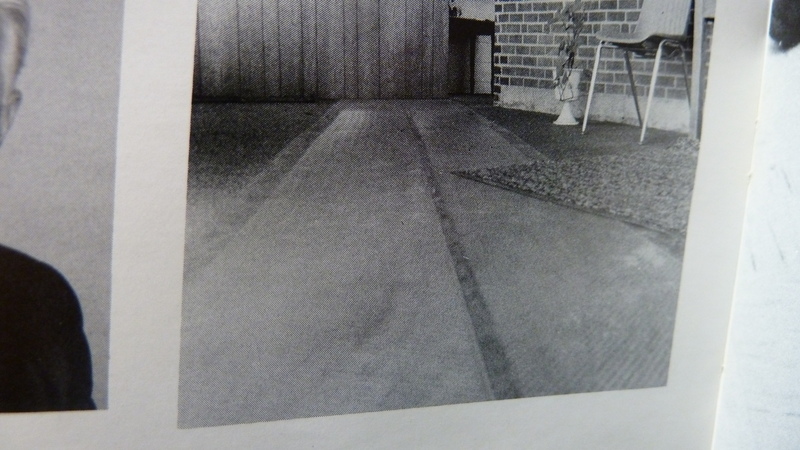 If anyone remembers who took the photos which illustrated the seminary essay, I’d love to know! Did you ever get in trouble with authorities at your school? Did you make peace? Last October, I saw both Myron Augsburger and Loren Swartzendruber at my class reunion during Homecoming at EMU. You ask: Did you ever get in trouble with authorities at your school? Yes, I did but as a teacher, not a student at Lancaster Mennonite School. Their dress code was too plain for me as I was moving into more fancy tastes, getting into trouble with patent leather shoes and a red dress, dark red mind you. Yes, I did do a blog post about that too–ha! The up-shot: The Dean who was among my detractors actually wrote a complimentary letter of recommendation when I moved south to teach in a non-Mennonite school. I went back and re-read your post (thanks for the link) and see that I actually commented at the time. Thanks for your story of getting into trouble as a teacher! Way to turn a criticizer into an ally. We must be very similiar in age! Thank you so much, Marian and no, I didn’t see a notification. Bless you!